I've eaten a lot of fabulous food in the last two months, and I wanted to share with you some of the best. 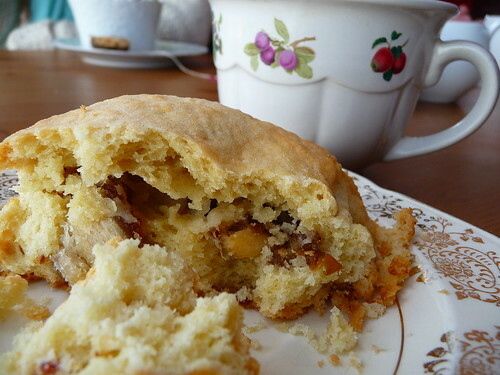 Hand-pie-style cobbler for breakfast at Curio Confections, one of my favorite local bakeries in north Seattle. 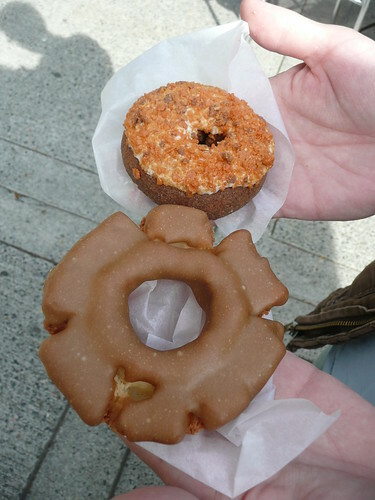 A maple-glazed and a Butterfinger doughnut from Voodoo Doughnut (tagline: the magic is in the hole), a bright pink doughnut truck in Portland, OR. 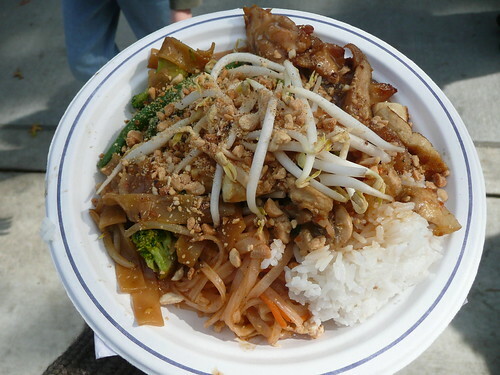 A whole delicious mess of Thai food, from a food stand at Portland's Saturday Market. 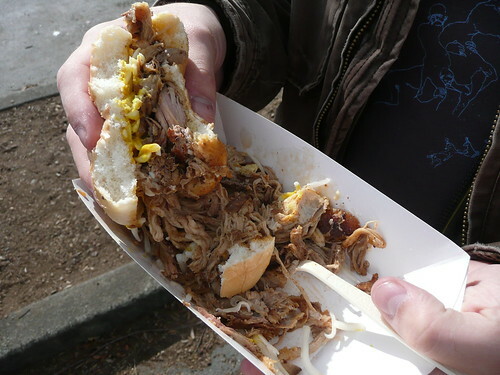 My boyfriend Lee loved this pulled pork sandwich at one of the Portland farmers markets. 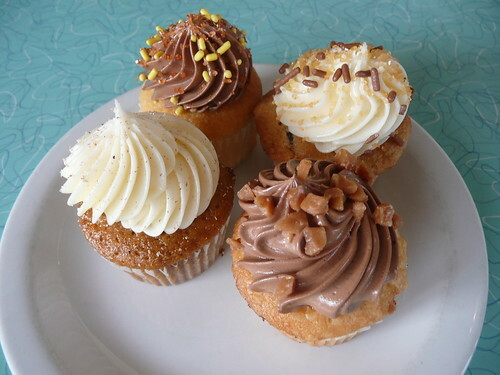 One thing I loved about Saint Cupcake in Portland was that all of their flavors also came in minis! 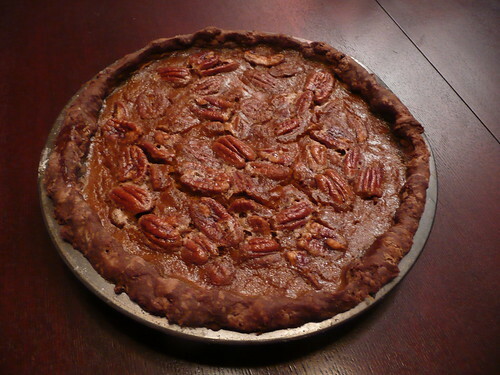 I made this chocolate-pumpkin-pecan pie because Lee requested it, but it turned out a little odd. I would definitely combine any two of those flavors in a dessert again, but all three was a bit much. 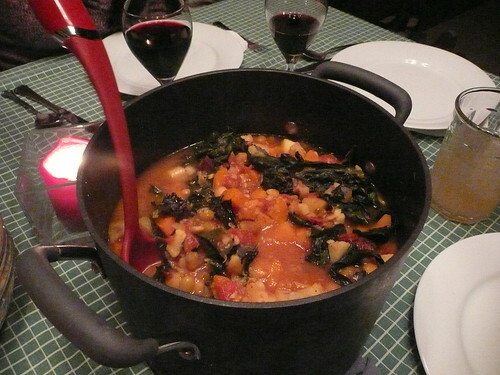 House dinner: Moroccan vegetable stew, cooked by my roommate Alison. 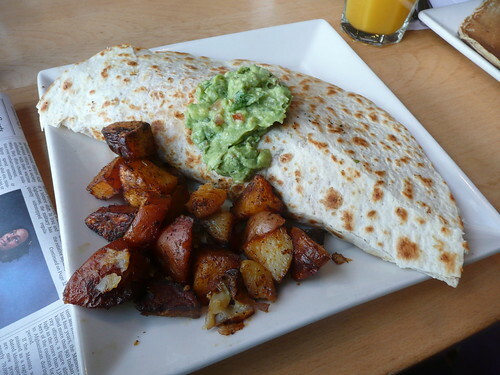 Migas, a tex-mex inspired eggs and vegetable hash in a giant tortilla, from Portage Bay Cafe in Seattle. 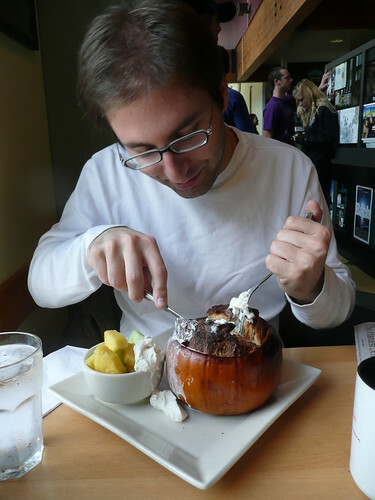 Lee's breakfast at Portage Bay: pumpkin French toast baked inside of a sugar pumpkin! 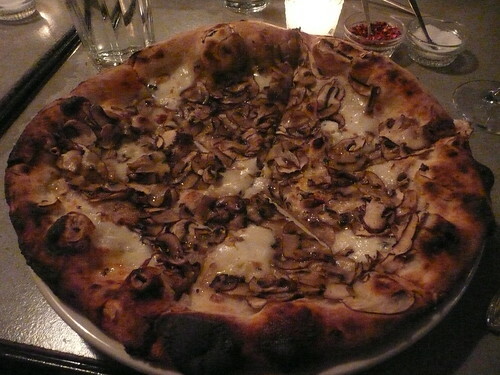 I've fallen in love with Delancey, a local woodfired pizza place run by one of the Seattle food bloggers I follow. Wait times are often 45 minutes to an hour, but I'mtotally hooked and always wait it out. 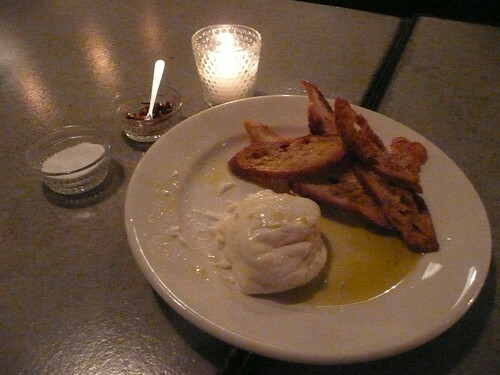 We started with the burrata, a big ball of creamy cheese served with salty crunchy toasts and drenched in olive oil. I got the crimini pizza, which was delicious. Lee got the same, but with the addition of local sausage. I think my favorite part is the crust--doughy and sweet around the edges, thin but never soggy in the middle, and charred just the right amount. 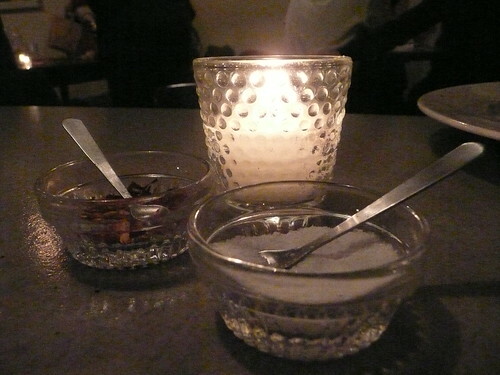 I also love that they serve salt and red pepper flakes in little bowls with even littler spoons. Very cute. 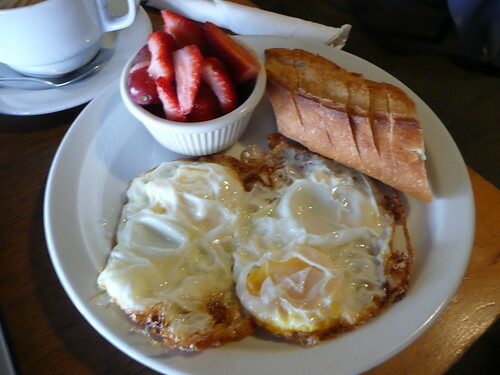 Breakfast at Coupa Cafe in Palo Alto: two fried eggs, warm baguette, fruit, and a latte. 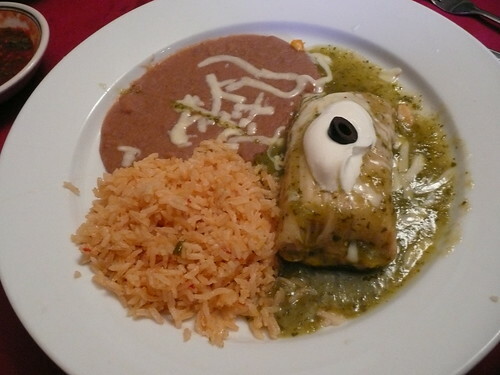 Tamale with squash, rice, and beans for lunch at a little Mexican restaurant in the Mission District of San Francisco. 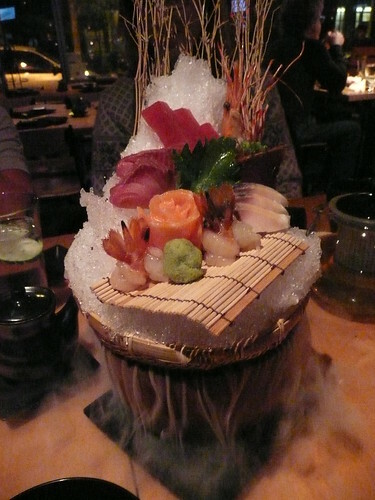 An utterly ridiculous appetizer at Blowfish Sushi in San Francisco: a sashimi platter set atop a foaming cauldron of dry ice. What's the most memorable thing you've eaten recently? Yummee! My most memorable recent thing would have to be the brisket last Friday at a friend's house. A huge chunk of meat, cooked at 250 degrees Fahrenheit for 14 hours. It smelled divine--like the best beef jerky--but it was fork-tender. Yummmm! I ate at Blowfish Sushi for my birthday this past February. Delicious!